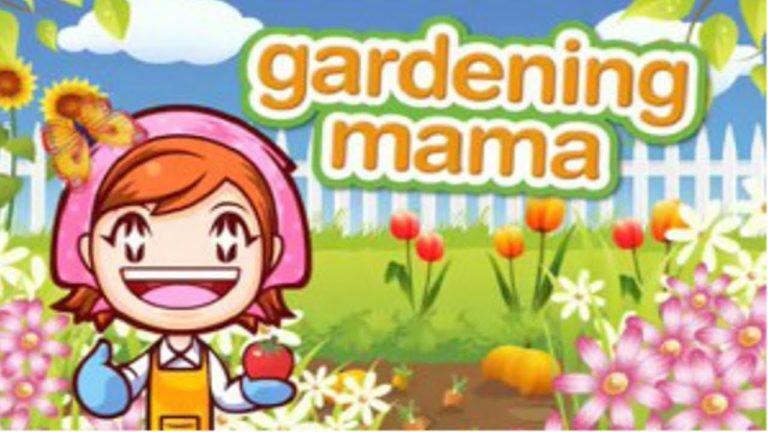 As a fan of the first two Cooking Mama titles, I was excited to try the first franchise off-shoot, Gardening Mama. Mama and I had gotten along pretty well in those first two games and the prospect of moving to a new environment was inviting. 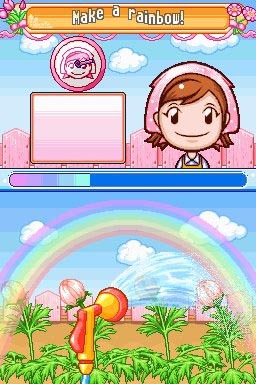 By the end of Cooking Mama 2 things were getting a bit too repetitive for my liking and I needed a break from the kitchen. 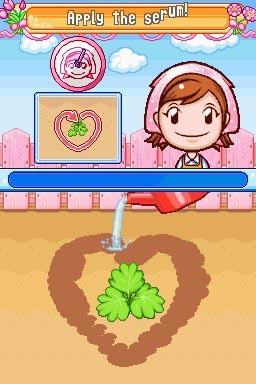 Unfortunately, not a lot had really changed from Cooking Mama to Gardening Mama. In single player mode (or Let’s Get Growing), the garden is broken up into sections: flowers, roses, fruit, and vegetables. Like any garden, you can only do so much at once with any particular plant, so more often than not you’ll be dividing your attentions amongst the various gardens tending to weeds, pests, and sprouts. And that makes sense as that’s typically how a garden operates. Once you’ve unlocked some more seeds and gardens, you’ll instinctively want to plant more items but the game has other plans. After finishing a task on one plant, you start getting notifications that other plants need tending to. Sure you can push them off, but if you do the plants won’t last for long and die off, forcing you to start from scratch and take a failing grade. So you are forced into a nearly unending cycle of rushing from one wilting plant to the next time after time, leaving you very little opportunity to start something new. When this turned into a regular occurrence, my desire to keep playing dropped substantially. The controls for Gardening Mama have not gotten any better. If anything, Mama has become more vague with her directions and I felt like I had no real freedom to do as much as I wanted to. Most of the directions were the same as before: drawing shapes on the screen, pouring water, blowing into the mic. However some instructions come simply with a vague description and no visual aid to assist you. I have yet to successfully bend a sapling’s trunk to tie down onto a trellis because I can’t seem to find the right spot on the thing to bend it and always run out of time or somehow snap it in half. If Mama didn’t want to get angry with me every time it happens, you’d think she’d give better directions to her students. But I don’t want Mama to fix it! Once a plant has completed a full life cycle, you receive your overall score and see what sort of butterfly you’ve attracted. The one I’ve seen most often is the white cabbage butterfly. If you’ve unlocked any new seeds or a special item, that will pop up for you as well. Exactly like every Mama game I’ve played before it and every other game I refuse to touch. Gardening Mama also features a multiplayer mode where you can link up with other players to exchange items or compete in mini-games. I skipped this feature but did mess around with customizing my garden accessories and dressing up Mama. It’s always nice to be able to change things up a bit, I only it had helped keep me interested in playing the game more. Usually I go for 100% unlocks in a game, especially in genres such as this one, however I just can’t bring myself to put this cartridge back into my DSi XL. Even if a game is based on chores, it shouldn’t feel like a chore to play it. 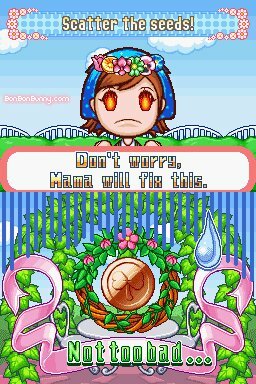 Gardening Mama has confirmed for me that I am finished with the Mama franchise. There will be no Crafting, Camping, or Babysitting Mama in my future and it saddens me to say that I now wish this series would just go away. It started off with promise and has turned into another Babiez/Horsez/Dogz-esque pile of mediocre and uninspiring code that should join the Atari 2600 E.T. game in a pit.